Designed to improve the audio quality of music, movies and games on notebook PCs and to play sound wirelessly through speakers in any room around the home. Creative, a worldwide leader in digital entertainment products, announces the Sound Blaster X-Fi® Notebook sound card, designed to make MP3 and iTunes music, movies and games sound better on notebook PCs. 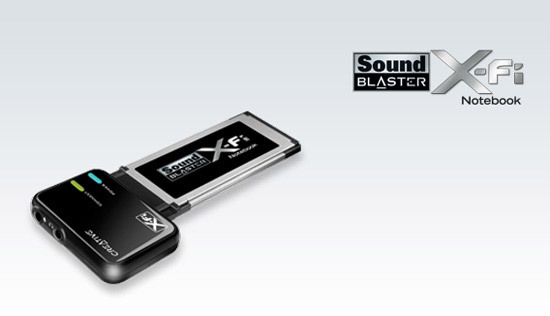 This new Sound Blaster fits easily into a standard ExpressCard slot to upgrade the latest notebook PCs to premium sound systems with award-winning X-Fi audio technology. When used with the Creative Wireless Receiver, the Sound Blaster X-Fi Notebook frees users from the need to run wires from their notebook PCs to their speakers. Instead, they can enjoy top-quality audio anywhere around the home, without cables! Audio is ‘broadcast’ from the Sound Blaster to the Creative Wireless Receiver, which can be connected to powered speakers or to a hi-fi system. As many as four Creative Wireless Receivers, each with powered speakers, can be supported around the home and up to 30 meters/100 feet away from the notebook. Users can enjoy all the freedom of wireless flexibility and hear their favourite audio without any delays or dropouts. Individual ‘zones’ can be created around the home to control playback independently in specific rooms. Creative’s award-winning X-Fi audio technology provides significant benefits to any audio listening experience. For music, X-Fi Crystalizer® technology utilises audio algorithms to selectively restore the instrumental or vocal highs and lows that may gave been damaged or diminished during the MP3, iTunes or other compression processes. For PC gaming, X-Fi CMSS®-3D technology provides a compelling surround sound experience for headphones, enabling gamers to hear the precise position of their opponents even when they cannot see them. The Sound Blaster X-Fi Notebook also features Creative’s EAX ADVANCED HD audio technology, for stunning positional audio realism in today’s hottest games. For movies, the Sound Blaster X-Fi Notebook includes a free download of PowerDVD software with full DTS and Dolby Digital decoding support. CMSS-3D technology provides virtual surround sound through stereo speakers or headphones for an immersive cinematic movie audio experience.